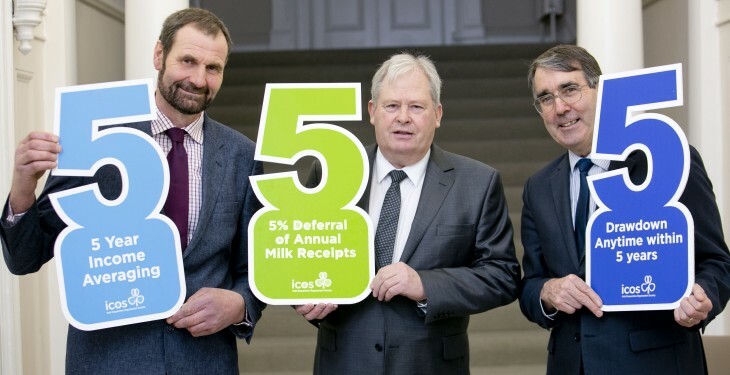 ICOS National Dairy Committee Chairman, Jerry Long; ICOS President, Martin Keane and CEO, Seamus O’Donohoe. ICOS, the umbrella body for the co-operative movement, has launched a new proposal aimed at combating extreme income volatility in the dairy sector. Five-year income averaging: The scheme should be open to farmers participating in the five-year income averaging scheme already in place. 5% of annual milk receipts: The scheme will permit a farmer to voluntarily defer up to 5% of their milk receipts in any one year. Five-year draw down period: The scheme will allow the deferred funds to be drawn down at any time within a maximum of five years, and subject to income tax at the time of draw down. Action is urgently needed from the next Government and we need to think outside the box in order to put in place a suite of measures to help dairy farmers to manage volatility. “ICOS has developed a workable and straightforward agri-taxation measure that will help farmers, especially during years of low milk prices. 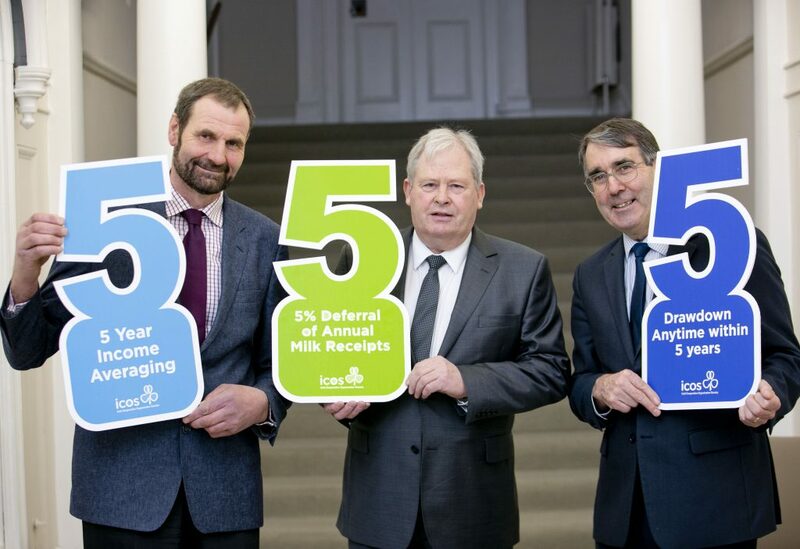 “The ‘5-5-5’ scheme will allow a dairy farmer participating in income averaging during a good year to defer a modest amount of income into a recognised fund, in order to draw down this income during periods of low milk prices. 1. How will the ICOS “5-5-5” Income Stability Tool work in practice? 2. Why is this measure needed for dairy farmers? ICOS says dairy farm income fluctuates from year to year due to circumstances outside the control of the farmer. External forces such as weather, geopolitical matters, currency, feed and oil prices, disease and macroeconomic factors can conspire to cause income volatility. Since the removal in the 2004-06 period of comprehensive EU market support measures, we are possibly in the fourth significant market downturn. Extremely weak markets occurred in 2006, 2009, 2012 and 2015/16. 3. Will this measure solve income volatility in the dairy sector? According to ICOS, this measure on its own will not solve income volatility within the dairy sector, but can play an important role in terms of helping farmers to manage the worst extremes of volatility. ICOS supports the adoption of a suite of measures to tackle income volatility affecting Irish dairy farmers. This includes enhanced EU support tools, greater use and uptake of fixed price schemes, the development of a European dairy futures market and the use of agri-taxation. ICOS believes that the use of agri taxation is a highly important tool, which the Government can introduce while respecting EU state aid rules. 4. What is the benefit for the farmer? The ICOS “5-5-5” Income Stability Tool provides a significant levelling effect, especially during years of low milk price. The scenario outlined below is a new farmer, married with three children, producing 400,000L of milk annually, with income averaging starting in year five. The milk price ranges from 25c/L to 40c/L over a nine-year period. The impact of the ICOS proposal is clearly evident in years three and eight with a low milk price of 25c/L. The volatility under the current income averaging system ranges from €8,170 to €56,170. While, the volatility under the ICOS proposal ranges from €23,170 to €48,170. 5. Is this a voluntary scheme? Yes, the proposed scheme by ICOS would be optional for the farmer. 6. Can a farmer draw down his income at any stage? Yes, the money can be drawn down at any time within five years, and subject to income tax at the time of draw down, but in any case must be drawn down within five years. 7. What happens to the deferred income? ICOS is proposing that the money be retained in the farmers name in a recognised, interest-bearing fund, which would be managed by their co-op, as a loan stock type instrument. This fund would be secure and available to the farmer when needed. 8. Is 5 year income averaging not an appropriate agri taxation measure, which is already in place to deal with income volatility in the farming sector? Income averaging was previously available over three years, and in Budget 2015 extended to five years. In reality, income averaging is tax averaging. Income averaging as currently conceived derives a benefit by ensuring that participating farmers aren’t forced into paying excessively high rates of tax in any one year. The tax benefits will arise where profits are increasing. However, these benefits will be clawed back when profits are falling. Therefore, there is a fundamental weakness in income averaging as a volatility tool, which the ICOS proposal is seeking to address. 9. Did the Agri Taxation Working Group which reported in October 2014 not discuss the possibility of introducing an income deferral tool? The Agri Taxation Working Group reported in October 2014, containing 25 recommendations. ICOS actively participated in the development of these recommendations. Subsequent budgets delivered tangible and positive taxation measures for the farming sector. However, income volatility did not receive sufficient attention. The main farming stakeholders including ICOS fully supported the introduction of an income deferral tool, as operated in other regions such as Canada and Australia. However, the Government raised concerns that a measure similar to the Australian Farm Management Deposits Scheme would be incompatible with EU state aid rules. That said, The Working Group Report, recommended that a risk deposit scheme be kept under review. 10. Is this proposal State Aid compliant? ICOS believes that the proposal fully complies with existing EU state aid rules. EU state aid rules recognise that in some circumstances government intervention is necessary for a well-functioning and equitable economy. Exemptions for government intervention are outlined in the Agricultural Block Exemption Regulation, which permits the adoption of the various rural development measures for example. In addition to measures outlined under the Block Exemption Regulation, the De-Minimis Regulation permits the granting of aid to farmers to the value of €15,000 over three years. The De-Minimis Regulation was used in 2015 in order to adopt the Super-Levy Deferral Scheme. For the purposes of the Super-Levy Scheme, the interest relief is regarded as a State Aid. ICOS believes that this establishes an important precedent for the ICOS “5-5-5” scheme. We believe that the interest benefits of the deferred taxation would be a State Aid. Therefore, the ICOS proposal would fall under the De-Minimis Regulation. 11. Why 5%, is this connected to EU State Aid Rules? 5% is a modest figure but delivers a significant benefit. The resultant fund, which a farmer can build up at any one time is never excessive. This will ensure that the proposal compiles with the €15,000 limit over a three-year period under the De-Minimis Regulation. For example, depending on the point in the volatility cycle, the state aid benefit of the “5-5-5” proposal could be the interest value of €20,000 at 3%, which is well under the €15,000 threshold. Furthermore, the inclusion of a modest figure such as 5%, will ensure that a farmer’s De-Minimis threshold is not fully exhausted by one support measure such as income deferral, providing the Government with the flexibility to continue the provision of emergency support, if needed such as the fodder aid scheme in 2013.